The Prague-based startup Davinci Travel System – a B2B platform for group accommodation – continues its growth. Davinci Travel System has achieved cooperation with 32 travel agencies and more than 2600 hotels in Europe since the beginning of its operation in February 2017. We took an interview with CEO, Alex Ilyash. Davinci Travel System is developing a B2B platform for group accommodation. It is automating the whole process, which is still being done by staff in travel agencies and hotels. According to its own calculations, it can reduce the costs of this process by about 30 percent. According to Davinci press release, it started operating on the market in February 2017 and finished its first year with rapid growth – its revenues exceeded 1,4 million euros. In some months, revenues were double compared to those expected in the company’s business plan. Oleksandr Komarevych (OK): – The team is very important for a startup at any stage. Who is on your team? Could you tell our readers about the uniqueness of each team member? Over 5 years of experience in the group travel industry. Worked as a manager in incoming travel agencies in the Czech Republic and France with responsibilities including communication with partner hotels and acquiring new partnerships. Opened and successfully exited an international tour operator with offices in 4 countries and revenue of over 700,000 Euros/year. Represented Czech tourism at the International travel conference in Mumbai, India in 2015. Role: Responsible for establishing new partnerships, negotiating contracts with tour operators and hotels, managing business operation processes within DAVINCI and assisting in the implementation of them into the software platform. Vadim Chumak – CTO, Generalist, Senior full-stack developer. Over 15 years of experience in IT. Worked in both corporate and startup environments. Product development manager by Agile methodology. Role: As the Chief Technology Officer the primary responsibility is software development of DAVINCI through the design of architecture and managing of tasks for developers on both front and back ends. Responsibilities also include the hiring and training of new developers. Worked as a hospitality manager in an incoming travel agency from 2013 to 2017. Manually processed thousands of requests per year. Has developed a great understanding of group booking processes, hotel rates, and conditions, as well as experience in troubleshooting. Role: Work closely with partner hotels, process and support group bookings, research and contact new potential hotels. Provide support and troubleshooting assistance to clients. OK: – What is the plan for the next 6 months? What is the vision? Our plan for the next 6 months is to expand to four new markets – Poland, Germany, the UK, and Italy. OK: – What is the most important lesson you received in your startup journey so far? I can describe this by a quote: “Think big, start small, act now.” The most important lesson we received so far is to act now. From our experience, it is more important to do A/B tests directly on the market than to spend months by analyzing and planning a market strategy. OK: – What are the competitive advantages of Davinci TS? How does it work? 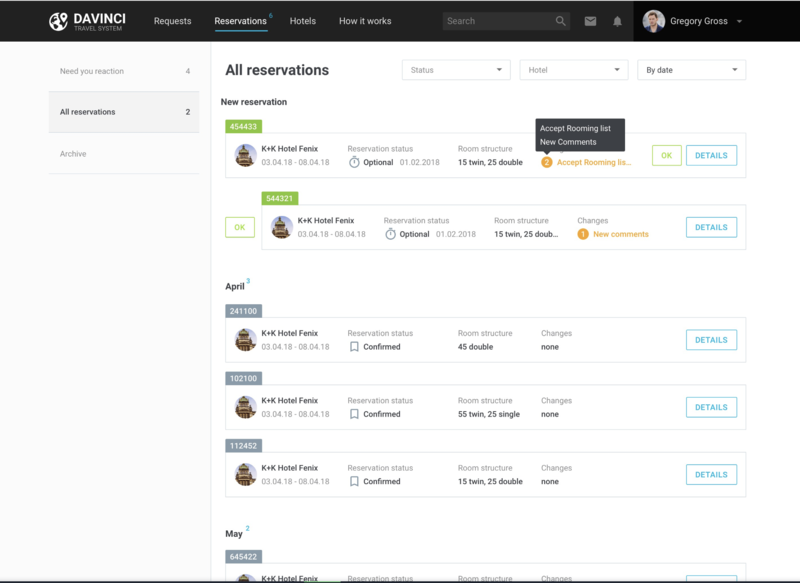 Davinci TS is capitalizing on the current opportunity by developing a SaaS platform which will replace all manual work involved in group booking processes for clients and hotels into one online system. The goal of Davinci isn’t just to send multiple emails at once, and that’s how we differ from others. We are building a digital SaaS platform that allows the automatization of the entire process of booking, management, and adjustments. Strategy: Hotels will utilize the platform that brings the largest number of groups. Our goal is to book 50 % of a group requests through Davinci for selected hotels. That’s why we will primarily focus on leading tour operators instead of corporate clients and schools as our competitors do. After achieving a high level of active hotel usage, we will be able to offer the booking of groups for corporate clients and schools online. All-in-one SaaS platform: We have spent time and effort meeting with hotels and tour operators while developing the Davinci interface, which now includes all necessary functions that support all aspects of group management while eliminating a majority of email communication. 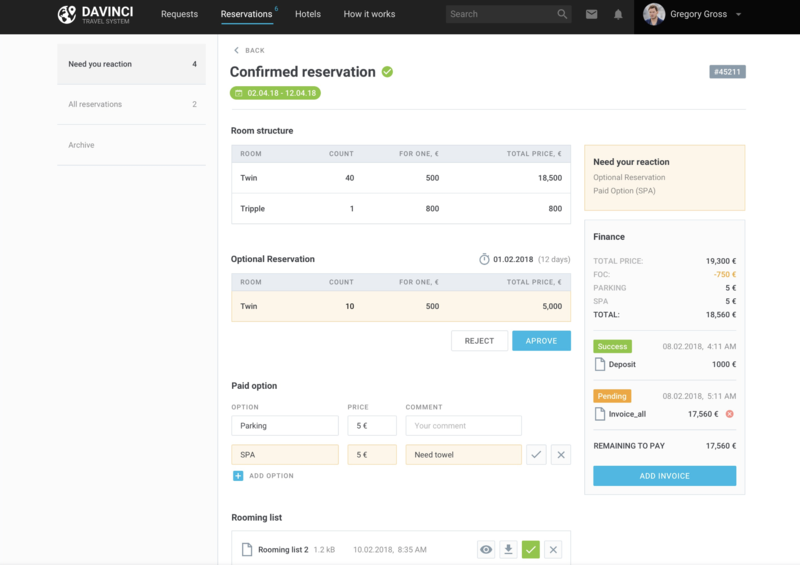 We will transfer all processes of booking and managing group reservations into a SaaS platform. By allowing direct communication between tour operators and hotels through the Davinci platform, we will cut out 95 % of manual operations done currently by incoming travel agencies (the remaining 5 % are manual operations in special circumstances). Partnership: Not all the hotels are suitable for the needs of groups. Considering our experience, we will carefully select hotels which will be connected to the Davinci platform and sign contracts for cooperation including established rates and conditions. We are focused on creating close and mutually beneficial partnerships as well as motivating hotels to transfer all of the group requests into the Davinci system in order to automate their group booking processes.